Keep your desk clean and organized with these cable clips! Easy to use self-adhesive backing allows you to peel and stick as needed.Easily access and organize your large and small cables the way you prefer!Works for speaker wires, computer wires, audio wires, camera cables, internet cables, twisted headphone cords, and much more.Good for surfaces such as: walls, plastic, wood, glass, metal, rubber. Package Includes3-Slot Magnetic Cable Clip Organizer x 1Item Description3-Slot Magnetic Cable Clip OrganizerKeep all your cables orderly and organizedEnsures your cables are not a mess and keeps your area clutter-freeYour whole setup will look a lot cleaner and controlled without your wires flailing aroundThe organizer is perfect for anywhere! Place in your car, at home or in the officeStick adhesive base of the holder will attach and securely hold onto most surfacesThe adhesive will cause no damage to the surface after removalEach individual clip uses a magnet to hold onto the main holderMagnetic hold is strong but also offers flexible movement for better organizationThe clamp hold design is easy to open and closeWide compatibility clip will hold the vast majority of cablesThe 3 clips have different sized grooves, so you can hold 3 cables of your choiceSlick and compact appearance will complement any environmentChoose the color which suits your environment and personality the bestDimensions: 3.86" x 0.79" x 0.28"Clip Diameter: 0.59"Compatibility: Cables up to 3.8 mmNote: Please peel off the film at the bottom of the holder before application⚠ WARNING: This product can expose you to chemicals including DEHP, which is known to the State of California to cause cancer and birth defects or other reproductive harm. 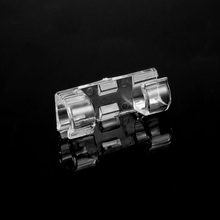 For more information go to P65Warnings.ca.gov.Product names are trademark of listed manufacturer or other owners, and are not trademarks of eForCity Corp. The manufacturer does not necessarily endorse use of these products. 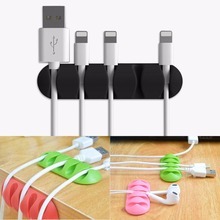 Organize cords/cables quickly and easily.Quick and easy self-adhesive backing.Easy open and close the cover. 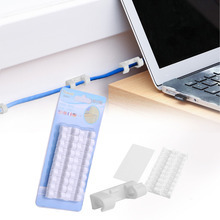 Easy to use self-adhesive backing allows you to peel and stick as needed.Easily access and organize your large and small cables the way you prefer!Works for speaker wires, computer wires, audio wires, camera cables, internet cables, twisted headphone cords, and much more. Easy installation for magnetic cable holder, individual clips feature magnets that allow you to create as much space as you wish in between the cables..
3M adhesive to fix the bottom of holder, removable adhesive works in plastic, wood, glass and metal surfaces, keep cords on desk, give you a neat and tidy enviroment..
High compatibility for cable clips, 4mm groove of magnetic buckles fit all standard USB cable, lightning cable, audio cable and type c cable within 4mm..
ABS silicone material, Elegant appearance for cable holder..
customer service with 12-month worry-free guarantee to ensure the high product quality..
A superior way for cable management, strong magnet force keep the cables in place and also easy to remove when use, more effective than using cable clips..
No trace Double-sided 3M adhesive to fix holder, tie up the cable with magnetic buckle..
Easy to stick and peel: Works in all surfaces, plastic, wood, glass, rubber, metal and others..
THREE-WAY CABLE CLIPS, enable you to organize three cables with a cable clip at a time. Save maximum space for you. Unique magnetic holder and clip separating design, you can easy to get the cable when needed and keep it tidy when not needed just the take the clip off of the holder.. 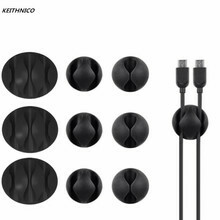 Neatly place your cables and cords anywhere you want and safely hold wires on a flat surface within comfortable reach without the clutter. 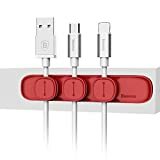 Ringke Cable Clip Holder gives a simple and convenient solution to perfect desktop cable management and serves as a multi-purpose organizer for your lightning cable, charging cords, micro usb cables, and much more in a dual gripped cable holder. 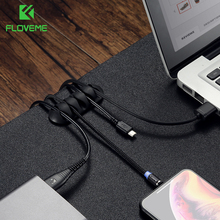 Instantly access your cables when you need them and in the preferred position you want without fumbling on flat surfaces. 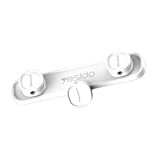 The 2-way slot grips intersect and enable you to organize up to two cables with the Ringke Cable Clip Holder at the same time. Keep your desk or workspace uncluttered and organized in one simple convenient cable management solution. 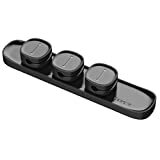 Easy to install the cable holder on nearly any flat surface with strong adhesive back that allows to grip and store your important gadget cables or cords with universal compatibility on clean and smooth surfaces – even including your car dashboard! Added features for the Ringke Cable Clip Holder also can function as a secure car mount holder or cradle when used together with the Ringke Ring accessory (sold separately) to access a secure hands-free navigation, charging, or music streaming mounting feature on your car dashboard.